Deathstroke and Batman have always had a contentious relationship. 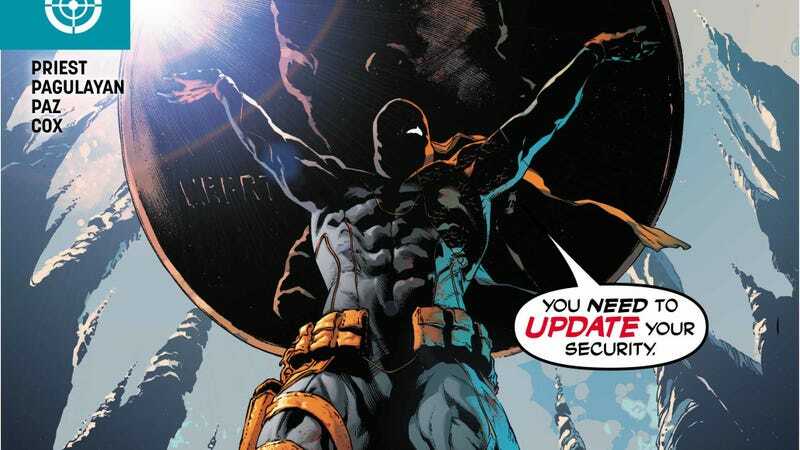 But the current arc of Deathstroke has taken that animosity to new heights, as the two men are thrown into a plot that puts the paternity of Batman’s son in question. Could Slade Wilson really be Damian Wayne’s father? It’s doubtful, but writer Christopher Priest has built a story that doesn’t make the possibility totally unfeasible. Priest’s phenomenal run on this series has always focused on Slade’s relationship to his family, and the writer folds Batman and Robin into that complicated family dynamic with the question of paternity. After giving readers a taste of what he can do with the Dynamic Duo earlier in his run, Priest goes even further with this father-and-son team in the “Deathstroke Vs. Batman” arc, highlighting how they both share certain characteristics with the titular assassin. This storyline has been a wild ride, and it all comes to a head in the two-part finale beginning in this week’s Deathstroke #34. This exclusive preview begins by highlighting the troubled bond Deathstroke has with his son, Joseph—who had his throat slit as a teenager by one of his father’s political enemies, leading to Slade losing his eye when his wife shot him in the back of the head. The art by Carlo Pagulayan, inkers Trevor Scott and Jason Paz, and colorist Jeromy Cox breaks down this trauma with stark detail, and throughout his run, Priest has showcased the strength of Pagulayan’s storytelling by giving him complex characters and powerful sequences to illustrate. Pagulayan has a firm grip on the tone of Priest’s scripts, allowing him to heighten the dramatic stakes as Slade’s life gets more dangerous and complicated.